If you love being lost in a cruel world accompanied only by the morbid sense that your own death draws closer with each step—and hey, who doesn't?—then boy have I got great news for you! 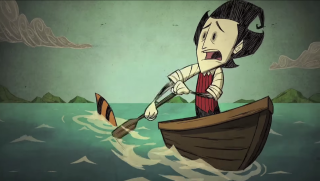 Klei Entertainment has announced a new single-player expansion for Don't Starve, called Shipwrecked. Coming later this Fall, it's actually not being developed by Klei, but by Capy—developers of Superbrothers: Sword and Sorcery EP, Super Time Force Ultra, and Below. The announcement says Shipwrecked will bring "new playable characters, biomes, creatures and seasonal effects." Somewhat obviously, the entire expansion will have a seafaring theme and add sailing to the game, which is the first time water has done more than impede your progress in Don't Starve. There's no word when (or even if) Shipwrecked will make it to the multiplayer version, Don't Starve Together, but you can expect the single-player version to hit PC, Mac, and Linux this fall.